What's the fastest way to make French toast fancier? Use brioche in place of the regular bread. We love this lemon version because the citrus notes keep the dish from tasting too heavy. It also pairs wonderfully with this 'Black Swan' Sauvignon blanc from Steenberg. For the French toast: If planning to bake immediately, preheat the oven to 425°F. Grease a 9x13-inch baking dish with nonstick cooking spray or butter. Slice the bread into 1/2-inch-thick slices, then cut each slice in half. Arrange half of the bread in overlapping layers in the baking dish. Sprinkle the bread with about half of the lemon zest. Whisk the eggs in a large bowl until well mixed, then whisk in the brown sugar. Whisk in the milk, vanilla, salt, nutmeg, and remaining lemon zest. Pour half of the custard over the bread. Layer the rest of the bread on top, and pour the rest of the custard over to coat. (At this point the casserole can be covered and refrigerated for up to 24 hours.) When ready to bake, take the casserole out of the refrigerator and let sit at room temperature for at least 10 minutes before baking. Heat the oven to 425°F. Bake the casserole for 30 minutes, or until slightly golden on top, and puffy. Whisk the lemon juice with the confectioners' sugar and drizzle the glaze over the hot casserole. Put a few teaspoons of confectioners' sugar in a small sieve or strainer, and dust the top of the casserole by tapping the strainer lightly over it. Let the casserole cool for at least 15 minutes before serving. 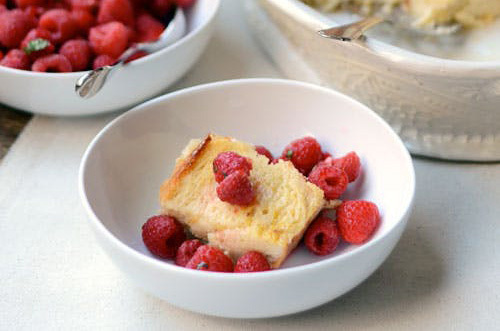 Serve in large slices, with raspberries on the side. For the minted raspberries: Toss the raspberries, gently, with the cava. Chop the mint leaves very fine and toss with the berries as well. Refrigerate until serving. Make your plain ol' quiche Lorraine more impressive by transforming it into this sky-high, deep-dish version. Serve it with a glass of Villiera Monro Brut. In the bowl of a food processor, combine the flour and salt and pulse 10 times to combine and lighten. Add the cold butter, pulse 10 times, about 1 second per pulse. Add the cream cheese and pulse about 12 times, just until the mixture resembles pebbles. Add egg, egg yolk, and vinegar and pulse just to combine. Do not overmix. Pat the dough into a rectangle and wrap in plastic wrap. Refrigerate for about 1 hour, until thoroughly chilled. When the dough is chilled, dust a work surface and rolling pin lightly with flour. Place the dough on the work surface. With the rolling pin, roll outward to form a circle, turning the dough slightly to ensure that it won't stick, until it is 6 inches wider than the diameter of the bottom of the 9- or 9 1/2-inch springform pan (for a 9-inch pan, the dough will be 15 inches in diameter; for a 9 1/2-inch pan, it will be 16 inches in diameter). Fold in half into a semicircle and lift with your hands or by rolling it onto the rolling pin. Center it on the pan and tuck the dough into the edge and up over the top, making sure not to pull or yank while fitting the dough. (This dough is forgiving enough to patch if necessary; just make sure it is thoroughly sealed and of course, try not to tear it!) Trim the top edge or flute decoratively if desired. Using a fork, poke the bottom and sides of the crust about 12 times. Line completely with parchment paper, making sure no small crevices are uncovered and leaving an overhang of 6 inches of parchment on either side. Fill with baking beans or pie weights (they should be at least 3 inches deep). Refrigerate for at least 4 hours, or overnight. When the crust has chilled, preheat the oven to 425°F. Lightly cover the top edge (which should be poking up — not hanging over or hooked over the edge or you won't be able to get it out later) with aluminum foil and bake for 20 minutes. Remove from the oven and wait until the parchment is cool enough to handle; then grasping the paper on either side of the crust, lift out the baking weights. Return the crust to the oven and bake for an additional 10 to 12 minutes. Remove from the oven and let cool completely before filling. Heat a large saucepan over high heat until it is hot. Line a platter with paper towels and position it near the stovetop. Carefully place the bacon in the pan, and cook, stirring often, for 2 minutes. Reduce the heat to medium and cook for 11 to 12 minutes, allowing the bacon to render all of its fat and become crisp. With a slotted spoon, transfer the the bacon to the prepared paper towels. Reserve 2 tablespoons of the bacon fat in the pan and discard or save the rest for another use. (To store, cover and refrigerate.) Add the shallots to the pan, reduce heat to medium-low, and cook, stirring occasionally, for 40 to 45 minutes, until softened and richly brown, reducing the heat as necessary to prevent burning. With a slotted spoon, transfer to a heatproof bowl and set aside. Increase the heat to medium-high and add half of the Swiss chard, cover and cook, stirring occasionally, for 1 to 2 minutes, until wilted. Add the rest of the chard and stir to move the fresh chard to the bottom of the pan. Cover and cook for 5 to 6 minutes, until all of the chard has wilted and released its liquid. With tongs, transfer to paper towels, cheesecloth, or a strainer, and when it is cool enough to handle, squeeze well and discard the liquid. Transfer to the bowl with the shallots and let cool. Reduce the oven temperature to 325°F. Line a rimmed baking sheet with parchment paper. Place the crust, still in the springform pan, on it. In a large mixing bowl, whisk the eggs. Add the milk, cream, salt, pepper, and nutmeg and whisk well. Add half of each of the reserved shallots, chard, bacon and half of the cheese and mix gently to combine. Temporarily remove the foil from around the top of the crust and set it aside. Place half of the remaining shredded cheese on the bottom of the crust. Top with all of the remaining bacon, shallots, and chard. With a ladle, scoop the egg mixture into the quiche. Return the foil ring around the top edge of the dough to prevent over-browning. 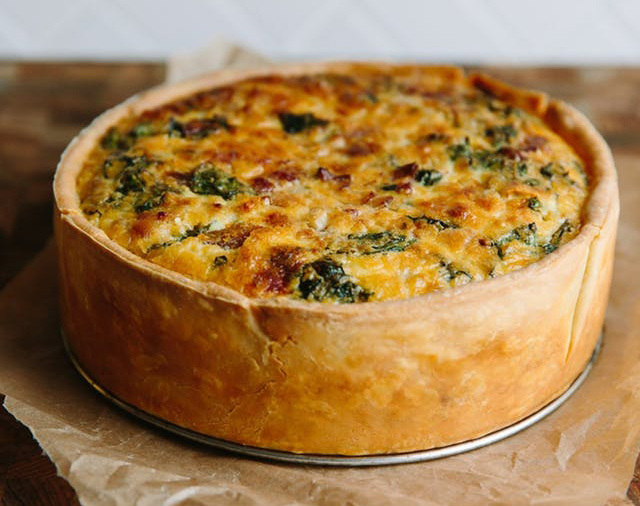 Immediately place in the oven on the baking sheet and bake for 1 hour and 30 minutes to 2 hours, or until a thin knife blade inserted into the the center of the quiche comes out without runny egg. The quiche will be quite soft, but please don't return it to the oven; it will continue to cook while it cools, and overcooking will dry it out. Cool for 10 minutes in the pan before removing the springform and serving. Dress up simple mixed greens by drizzling them with a brown-butter vinaigrette made with walnuts, garlic and rosemary. We like this fancy salad to be enjoyed with a glass of La Vierge Nymphomane Red Blend. Heat a small skillet over medium-low heat and add the walnuts, butter, 2 tablespoons of the olive oil, the garlic, rosemary, salt and pepper. Cook very gently, stirring often, until the walnuts turn golden brown and the garlic has cooked, about 10 minutes. Add the remaining 3 tablespoons olive oil to the skillet to slow the cooking, and set aside. When ready to serve, toss the greens with a little salt and pepper. 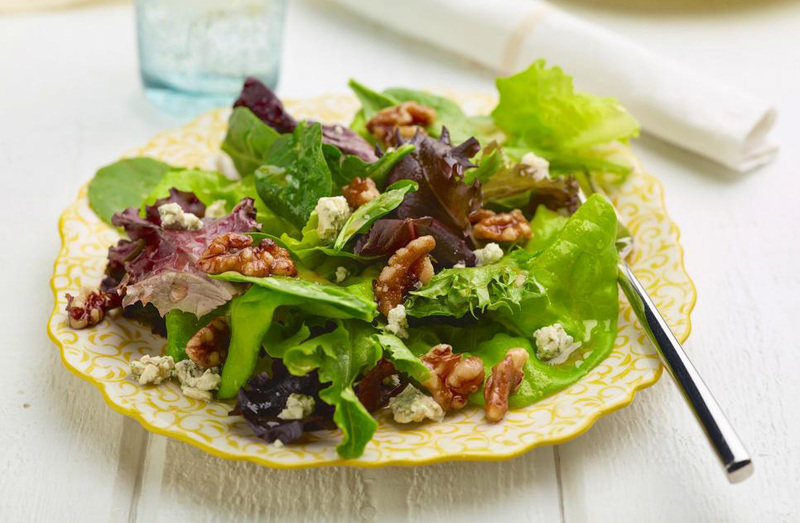 Add the lemon juice and vinegar to the walnut mixture and spoon the nuts over the salad, adding as much of the dressing as needed to lightly coat the leaves. Add the blue cheese, and toss again. 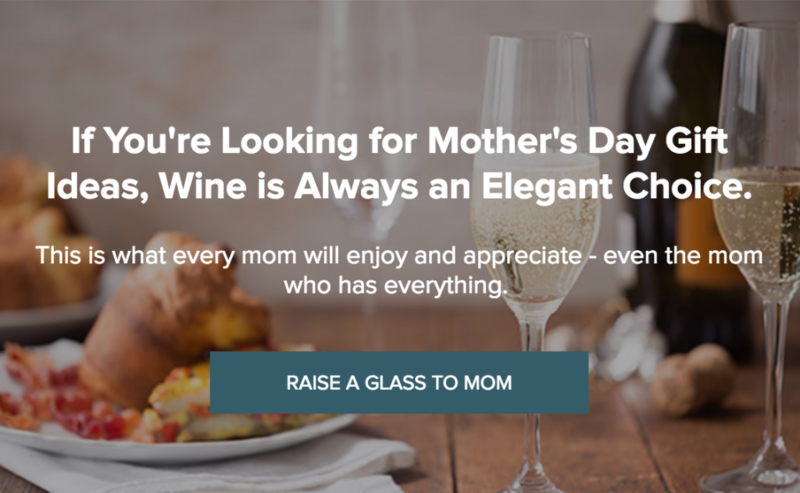 *GET 15% OFF MOTHERS DAY WINE COLLECTION. THE OFFER CANNOT BE COMBINED WITH OTHER OFFERS AND WINE CLUB MEMBER DISCOUNTS. THE OFFER WILL EXPIRE ON 5/13/18.